Expanding on the renowned range of dynamics processors Drawmer introduce an affordable Three Band Stereo FET Compressor that every engineer will completely appreciate - the 1973. The culmination of 30 years of development and experience, the 1973 combines the functionality and control of the world class Drawmer S3 with the familiarity and quality of the illustrious 1960 and 1968, providing three bands of transparent, intuitive compression for the price of a conventional single full band compressor. How does the 1973 differ from a full band compressor? In essence, the 1973 comprises a set of crossover filters that splits the audio signal into three frequency bands, each split signal then passes through its own compressor and is independently adjusted, after which the signals are recombined and the final Wet/Dry mix and levels can be adjusted. The advantage is that one band's compression has no affect on the others. 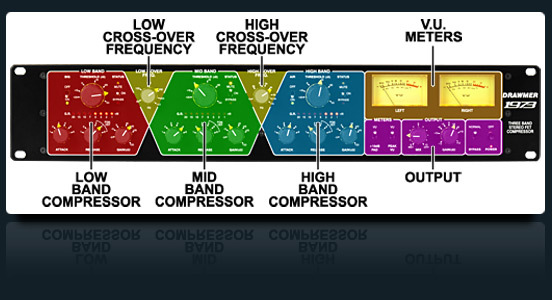 What's so good about a three band compressor anyway? 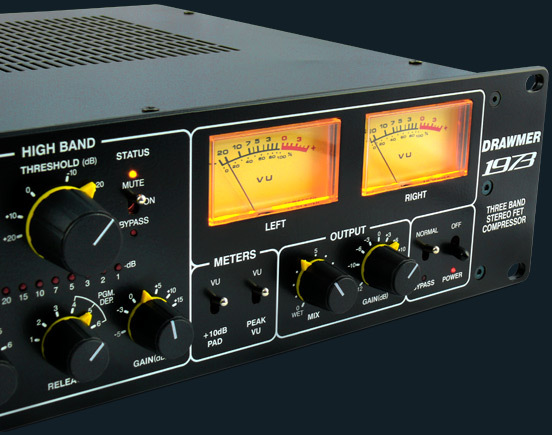 The 1973 can pull off amazing feats that a single-band compressor could never accomplish. For example, it can easily prevent an acoustic guitar, cello, or double bass from sounding boomy on low notes without thinning the highs. Are you recording a vocal track that sounds too shrill? The timbre can easily be altered without eliminating detail and clarity. Adding heavier compression in the bass band can add to the thickness and richness of the voice, in the mid band raspiness is controlled, whilst compression to the high band can give sizzle and definition to an otherwise bland voice. In addition, sibilance can easily be tamed. In a mastering situation, having independent control over each band can resolve a problem mix, pulling out individual instruments, brightening the brilliance/air or making the bottom end of a mix sound huge while simultaneously avoiding "pumping" or "breathing" artifacts and increasing headroom. Multiband compressors can be intimidating and difficult to use due to the number of controls and poor lay out, with this in mind, the 1973 has been designed to be as simple, familiar and intuitive as possible whilst still giving complete control over the audio. The front panel consists of three near identical compressor bands, flowing left to right, with the Variable Crossover Frequency knobs seperating them. To the right are the large, illuminated V.U. Meters, with Output controls underneath. Incorporated into the 1973 is the 'Mix' Control. This acts like a 'parallel compression' effect that mixes the Wet (compressed) and Dry (original) signals to provide a simple and exact way of controlling the amount of compression used - all with the turn of a single knob. One criticism of multiband compression is that it is possible to take the effect too far and ruin a mix - this is easily prevented with the 1973 by the use of the Mix control just by mixing in less of the wet signal and more dry. By the same token, the mix control can add more compression simply by adding more of the wet signal. It's that simple! 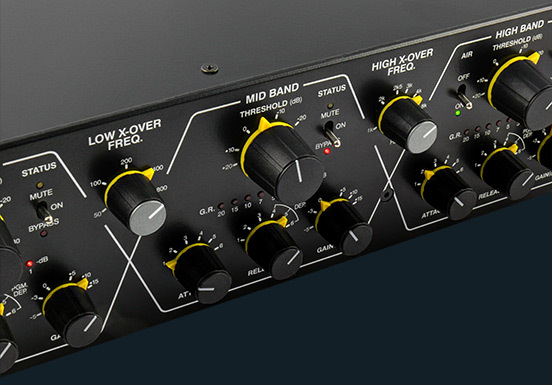 "This is not only a great multi-band compressor but one of the nicest hardware dynamics processors we have used in some time."